Southern Illinois University Edwardsville students looking to pursue careers in health-related fields had the opportunity to network with more than 40 leading healthcare employers during the annual Health Careers Fair held Monday, Nov. 14. The event was hosted by SIUE's Career Development Center. 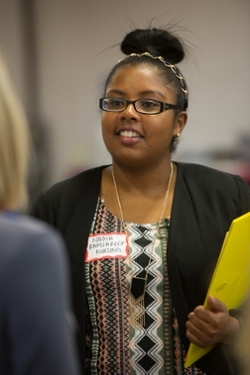 Students nearing completion of degrees within SIUE’s health-related disciplines, such as nursing, pharmacy and public health, shared resumes and learned more about available internship and employment opportunities. Employers in attendance noted their past success with hiring SIUE students, emphasizing their professional preparedness upon graduation. “We have multiple opportunities for students to build their career, with flexible scheduling and pay that may help them during school and beyond,” added Jerrica Ross, human resource coordinator for Eden Retirement Center in Glen Carbon. 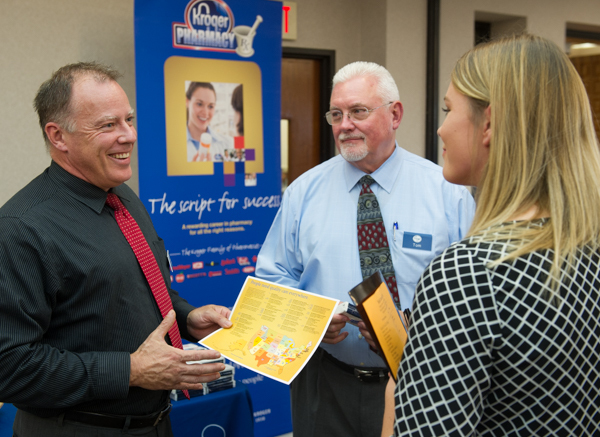 Photo: Representatives from The Kroger Co. speak with fourth-year pharmacy student Kelly Korza during the 2016 Health Careers Fair at SIUE. Nadia Ramsaroop, a senior nursing major, spoke with a prospective employer at the Health Careers Fair.